Stir together the flour, baking powder, salt and sugar in a large bowl. Make a well in the center. In a small bowl or 2 cup measuing cup, beat egg with a fork. Stir in milk and oil. Pour all at once into the well in the flour mixture. 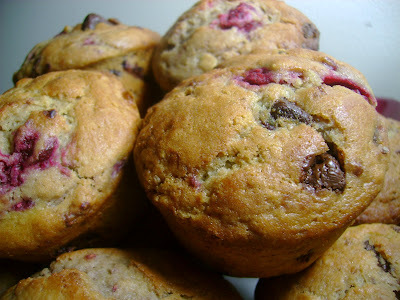 Add the Hershey's Chocolate RaspberryCream Filled Chips.